Dave and Mari Clack at their South Hill home. When students go to medical school through the University of Washington's regional WWAMI program in Spokane, they're in for years of hard work, but unlike students at most medical schools, they have a support system that's ready to help out when life kicks them in the pants. WWAMI is short for Washington, Wyoming, Alaska, Montana and Idaho, and students from all five states train to be doctors through the WWAMI program in Washington. 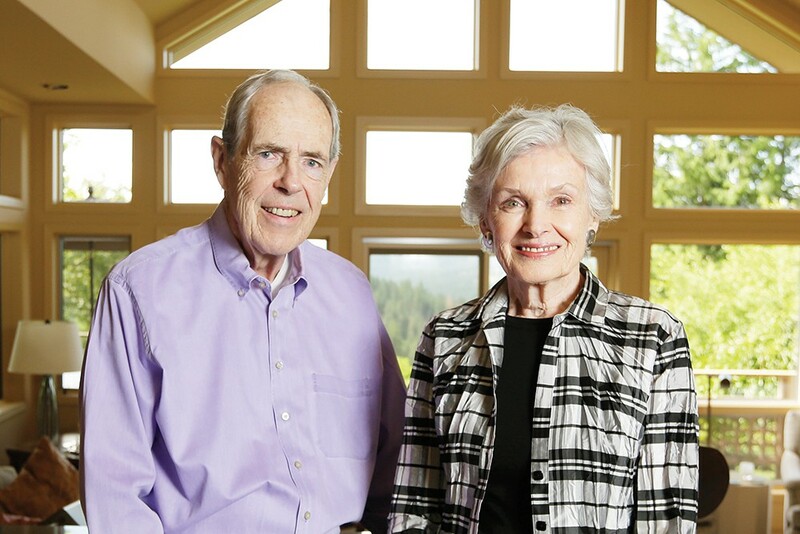 Mari and Dave Clack helped start the Friends of WWAMI Spokane to assist medical students with scholarships, but also to help out with aspects of daily life that can make school that much more stressful. Your daycare is closing and you need to find a new center? They'll help you figure it out. You car has broken down? An emergency fund can help with the cost. The Friends host dinners and celebrations with the students, so they'll get a better introduction to the Spokane community, Dave says. "Frankly, for those of us who have lived here a long time, it was a little bit of a recruiting effort, so that when they finished their medical education and their residency and became doctors, they would consider Spokane as a great place to come live and raise their families and practice medicine." The Clacks keep up with students in a personal way: One year when they were hosting a holiday party, a scholarship student in Seattle asked if he could bring a carload of people over, and they said, "Of course!" The program has had a presence in Eastern Washington since the 1970s. Until a few years ago, students would spend their first year at Washington State University, then go on to Seattle and clinical rotations. After WSU decided to split with UW Medicine and start its own medical school a few years ago, UW partnered with Gonzaga University. Now the first two years — recently compressed into an 18-month curriculum — are hosted on Gonzaga's campus, and students are getting into the field more quickly. The Clacks were instrumental in helping with the transition, and have long had a passion for supporting doctors and students. Both are UW alumni (Dave, 1957; Mari, 1958). Mari served as a UW regent, and her father, Clyde Jensen, was one of the doctors who helped start UW's medical school after World War II. Between them, the couple's achievements are almost too numerous to list. Mari has a long history of serving on boards in the community: Among many others around the state, she has served on the boards for Mothers Against Violence in America, National Parks and Recreation, Planned Parenthood of Spokane and YWCA of Spokane, and she helped co-found the Women Helping Women Fund. Dave served as director of Avista's board for nearly 20 years, chaired Northwest Venture Associates, opened the Spokane office of Meridian Capital private banking investment firm, and has served in many other positions. "Due in part to your leadership, not only did the UW School of Medicine remain in Spokane after separating from Washington State University, but the program expanded dramatically and dynamically, working with Gonzaga University to form the Regional Health Partnership," writes Paul Ramsey, CEO of UW Medicine and Dean of the School of Medicine, in a thank-you letter to the Clacks. "With your counsel, the medical education program turned a challenge — the need for a new partner — into a wonderful opportunity. When we first asked you to take on the task of welcoming students to the Spokane community, we had just 20 first-year students. Now the program has 100 first- and second-year students combined, housed on the welcoming Gonzaga University campus." One of the activities the Clacks have most enjoyed hosting is the white coat ceremony. Students used to get their white coats partway through their medical education, but the Clacks and Friends encouraged the school to hold the ceremony before the first day of class. "It was fascinating to see the transformation that took place right on that stage when the doctor put the white coat on that student," Dave says. Mari says one student came up to her before a ceremony and said he was too nervous; he couldn't do it. "I said, 'You're not going into neurosurgery, just put your arms in there!'" she says. "He did, and walked up to me, and said, 'That's the best feeling, because I'm telling everybody I'll do the best I can.' That's what I want any student ever to feel, that this school, this opportunity, is helping you. Is there to not only teach you, but to have your back." After years of forming close relationships with students, and with the school's transition to partnering with Gonzaga, it's time to let others in the community take a turn and share their own ideas to improve the program, the Clacks say.